Ideal for over-processed hair weakened by techniques, such as straightening, and hair-styling appliances, this shampoo formulated with calendula* gently cleanses the scalp and hair, and offers lasting control. Enriched with a moisturizing complex, it leaves hair soft and shiny, making it stronger and easier to style. For 90% of the women who tested it, their hair was silky and its original beauty preserved**. * From Spain and grown in the Parc de les Olors. This park aims to revive the cultivation of aromatic and medicinal plants while protecting a unique environment. ** Use test conducted on 21 women for 3 weeks - findings based on self-assessment. Gentle cleansing base: cleanses the hair and scalp. Synergy of conditioner agents: forms a coating film on the hair to facilitate styling. Calendula extract: source of flavonoids and carotenoids. Plant-based ester: brings strength, softness and suppleness. Phospholipids: Tames and sheaths the hair. Biomimetic ceramide: Strengthens and preserves the original beauty of the hair. White clay: remineralizes the hair. Apply to wet hair, gently lather, then rinse thoroughly. 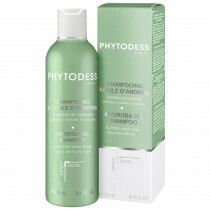 Follow with a PHYTODESS hair care product for lenghts and ends.